The third-brightest star in Orion, Bellatrix, is often overlooked. Yet, Bellatrix is such a wonderful star. According to Richard Hinckley Allen’s classic book Star Names: Their Lore and Meaning, the Latin name Bellatrix means Female Warrior, which some find odd since the original Arabic title translates as the Conqueror. But women understand. Bellatrix represents Orion’s left shoulder. Although it appears only as the 22nd brightest star in our heavens, in reality it is a hot, blue giant some 240 light-years away. Also, look for Saiph, the right knee counterpart to Rigel, the left knee in Orion. The four stars, Betelgeuse, Rigel, Bellatrix and Saiph form the familiar rectangle of Orion. 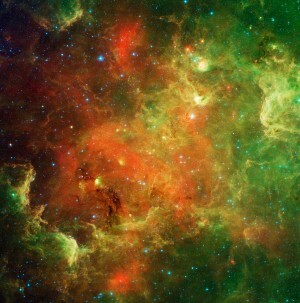 Saiph is a blazing hot supergiant star 720 light years away. By the way, yesterday, we talked about Orion’s two brightest stars. Look back if you missed reading about them. The constellation Orion takes center stage this month and rightly so. With an inordinate number of bright stars, it is one of the most prominent constellations in the sky. 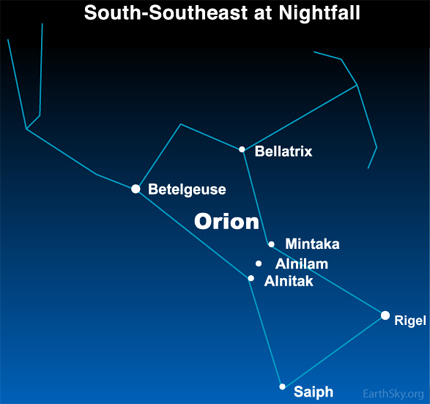 Look for Orion in the east-southeastern sky from around 7 to 8 p.m.
Site contents copyright © 2019 Recorder Online	except as noted. All rights reserved. | 88 queries in 2.438 seconds.